In all other mediums, your consciousness interprets the medium. In Virtual Reality (VR), your consciousness is the medium. The current state of VR is equivalent to the first year of cinema. It is a rapidly growing medium making waves in the wider tech, advertising, and entertainment communities. Los Angeles, the home of the entertainment industry, has naturally become the hub of the next revolution of Virtual Reality storytellers. Chris Milk, Nonny de la Peña, Jessica Brillhart, Simon Che de Boer, to name a few, have revolutionized virtual reality and are taking it a step further. Joining this group is a pioneer named Hansjeet Singh Duggal. Hansjeet had a life changing experience when he met like-minded story tellers Shamola Kharkar and Jonathan Hirsch in 2015. That moment was the inspiration for Hansjeet's virtual reality animated project "Freiheit". "Virtual Reality is like a machine that generates empathy because you are able to experience a story from someone else's eyes, it has given birth to a totally new form of narrative storytelling," says Hansjeet. While the technology and the audiences are developing, stand-alone films in VR are a good starting point. One such example is “Freiheit”, directed by Hansjeet, produced by Shamola Kharkar and written by John Hirsch. This hand-drawn volumetric film, is a tale of hope and sacrifice told through the eyes of a young child who is taken to a concentration camp along with his mother. By marrying art with technology, Hansjeet creates historical narrative films using Virtual & Augmented Reality, 360-degree imaging, and animation. He then supplies these films directly to museums. For many years, we have seen the interest in historical museums decline, with the result that generations do not completely understand the past that defines them. Hansjeet believes that the relationship between museums and their audiences will be redefined. While Hansjeet is talking with leading museums throughout the world, he is playing a vital role in the narrative storytelling of VR, shaping the potential of what the medium can do, and writing a new grammar for VR storytelling. Like any other medium, Virtual Reality is at its best when it leaves a lasting impression, and such an impression was made by “Freiehit” at Annecy in June 2018 at the Festival International du Film d'Animation d'Annecy. Annecy International Animation Film Festival is one of the oldest and most prestigious events of its kind. France’s Annecy became the temporary international capital of animation from June 11-16, 2018. From more than 3,000 entries, only a handful were selected to be presented and screened at Annecy. Hansjeet's next stop was the Parliament of the World's Religions in Toronto in November 2018 which had an attendance exceeding 10,000 from 80 nations, and more than 200 unique spiritual backgrounds. Hansjeet, presenting under the Youth Voices for Change category, shared how Virtual Reality is all about mastering one's senses. Virtual reality's growth as an art form is encouraging. Hansjeet says "it compels to cover stories and experiences because they tell important stories in a way that no other medium can". The technology behind the creation and dissemination of VR content is becoming mature enough to communicate its message without being distracting. Finally, we seem to have moved beyond the novelty of virtual reality and are starting to see it being used to tackle various important issues. This is where Hansjeet is pushing this technology to its limits and is starting to transform medical care. With his prototype, patients can immerse themselves in a peaceful virtual world with headsets that take their focus off the discomfort associated with their medical problems and treatments. This is a novel alternative for patients for whom anesthesia and sedation can be risky. Hansjeet is talking with several health care institutions regarding partnering. “In the end it's all about mastering human senses, and virtual reality is the story of humanity mastering our senses, and marrying aesthetics with cutting edge technology". 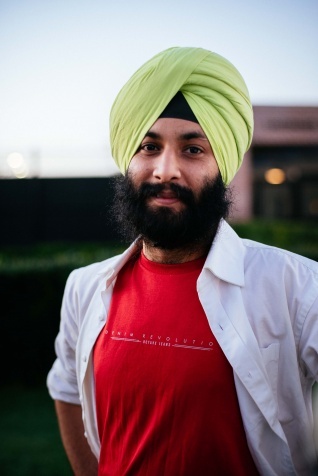 Hansjeet is a graduate of The Sikhlens Scholar program which assists aspiring filmmakers with counseling and admission into film schools, as well as providing them with financial and moral support. For more info on SikhLens, please go to SikhLens.com. For contact and info re the SikhLens Scholar program, please contact info@SikhLens.com. He Brings Virtual Reality Alive"